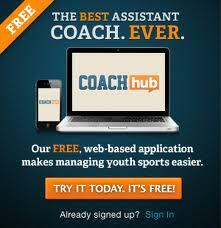 There are many liberal minded people in power in youth sports who demand no score games and no standing leagues. They do not want little Johnny or Suzie to feel bad when they lose. They think that the self-esteem of little athletes is fragile. Is it the kids who cannot handle losing or is it the parents? Maybe these no score - no standings youth leagues are meant to control parents who can act kind of kooky when their kids are not winning. But the common reason for no score - no standings youth leagues is the self-esteem issue. I personally think that real self esteem is established by overcoming and then triumphing. It does not come from being praised for everything regardless of results, talent or effort. Fake praise and false situations do not lead to a positive self-esteem. Kids are smarter and more perceptive than these liberal minded youth sports community organizers give them credit for. There are going to be lots of kids who are not good at sports and never will be. Are they doomed to a low self esteem? No. They may find that they are talented at music and their self-esteem will be derived from working hard and learning how to play an instrument. Others may find that they are talented in math or acting or debate, their self-esteem will be derived from success in these endeavors. I bet those liberal minded no score types loath the penalty kick in soccer. When a PK is awarded, there is a clear winner and a loser in a drama that plays out under a spot light in front of hushed fans. 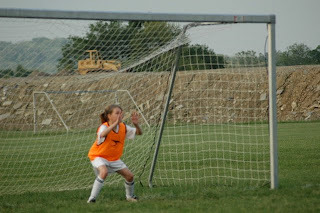 Last night, my daughter, CC, was the goalie when a penalty kick was awarded to the opposing team. The ref gave my daughter the instructions. He then turned to the striker and gave her the instructions. The striker placed the ball on a tuft of grass. My daughter placed her heals on the goal line. I was thinking that she has saved 100's of my shots on her and after each shot she would say, "Daddy kick it harder." I knew that the odds were for the striker and against the goalie, but I was confident that CC could handle it the situation emotionally whether she stopped the ball or not. The ref blew the whistle. The striker approached the ball and absolutely drilled. The ball sailed toward the net slightly right of center. CC jumped up as high as she could and deflected the ball straight up in the air. The ball landed in front of the goal. The striker and the entire opposing offense crashed the goal for the rebound. CC grabbed the ball and darted out, she then punted the ball down the field. The ball landed just beyond the mid-line and took a huge bounce. The striker for our team ran under the ball and with one touch drilled it into the goal. CC was beaming. She said after the game, "I have never had so many high 5's." It was a memorable play. A play my daughter and I will remember forever. It was a self-esteem building play. 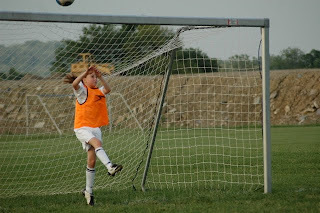 The girl who missed the shot is an elite soccer player, playing at the highest level in the region. 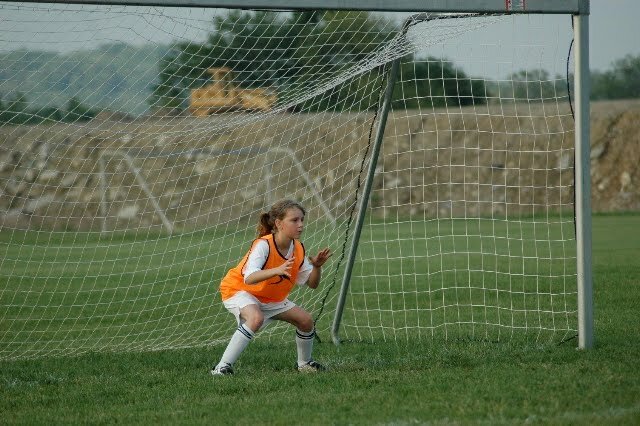 The fact that she was chosen out of all the other girls on her team to take the kick should have been a honor. She should have felt good that she struck the ball with power and placement. She will likely not remember this play in a week or two and her self esteem as an elite soccer player will remain intact. Kids know the situation. Kids know the score and Kids are going to grow up to be who they are going to be regardless of whether they were on a winning team or not. CC played in a soccer tournament this past weekend. Her team, the Sabres, was clearly the best team in the tournament. Being the best team in the tournament does not guarantee victory. There were two pool play divisions. I assume that the divisions were randomly selected. The two best teams in the tournament were in the same division, the Sabres and the Bombers. The first game of the tournament featured the Sabres against the Bombers. The Sabres are not a morning team and didn't start well. The Sabres got down, 2-0 in the first half. They managed to win the second half 1-0, but it was not good enough. The Sabres went on to win their next two pool play games 7-1 and 8-0 respectively, but that was not good enough to win the pool and advance. The Bombers won their games 5-1 and 6-3 to advance to the finals. They ended up winning the tournament. CC played well she had 2 goals and 2 assists in the tournament. Between soccer games on Saturday, my daughter was able to play 3 innings of her softball game. I tried to talk her out of playing on the fear that it was too much. She wouldn't hear it. She wants to do it all.